A well-integrated technology stack helps streamline routine management tasks and also greatly increases the ability to use information to improve planning. A “technology stack” is essentially the group of software applications that helps a business to manage their core functions. With the universal growth of platforms powering marketing and business functions, the importance of a technology stack is being recognized in all businesses, old and new, small and large. 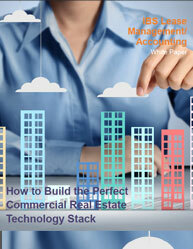 In this whitepaper as you’re assembling a real estate technology stack for your organization, take a look at these best-in- class technology platforms: Lease Management/Accounting-Helps to serve as the core of the real estate tech stack Project Management and Procurement- Helps to centralize project data, increase transparency, automate bid management and standardize reporting Budgeting and Valuation-Helps organizations maximize performance and profitability Marketing-Provides innovative and versatile marketing tools for all types of commercial real estate properties The enterprise lease management/accounting platform serves as the core of a well-assembled commercial real estate tech stack. Adopting a mobility strategy in construction enterprises is having a tremendous impact in transforming the workforce efficiencies. A good mobile technology solution will contribute significantly to a construction industry’s ability to better manage its own costs and, at the same time, pass the value on to its clients. Anyone interested in learning about how mobile technology can be applied in industrial settings such as in construction project? 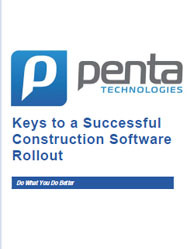 Read this whitepaper to: Learn how real-world construction industry challenges are being addressed. Learn how accurate tracking in the field not only improves visibility and accountability but it also enables construction companies to make more accurate bids for future projects. Learn how construction companies can quickly mobile-enable their workforce to securely and effectively interact with key business IT functions. 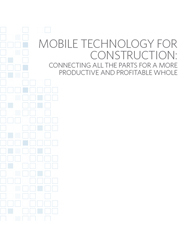 Key factors that are driving the demand for mobile technology in the construction industry Read this informative whitepaper that describes the development of mobile technology which could address some of the issues and pressures prevailing in the context of the construction industry.